Fred was born in Naples, Texas on August 9th, 1936 to Robert and Mattie Hill. 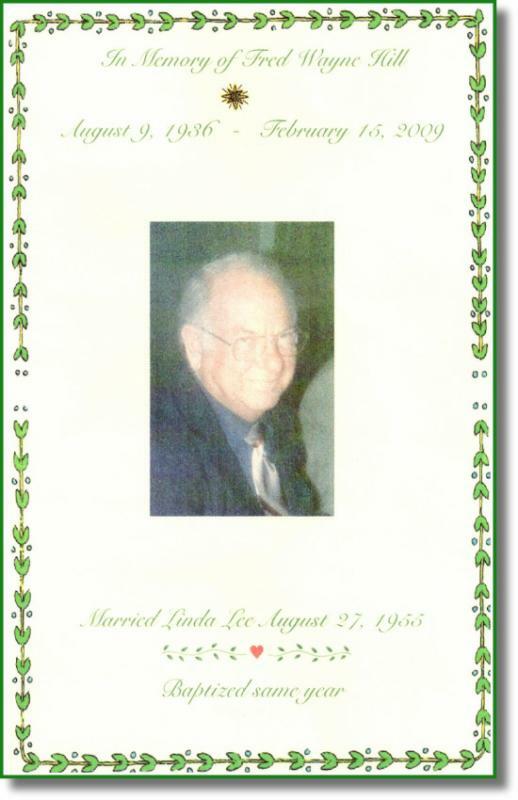 He and Linda Lee (my Mother-in-law) were married August 27th, 1955. They had three children, Cheryl, Debra, and Fred Jr. Fred loved fishing, and he was also very accomplished at his much loved hobby, woodworking. Fred drove a truck for a living and tried retiring twice, once from Insured Transporters, and finally from Biaga Brothers. His favorite song of all time was “Unchained Melody” by the Righteous Brothers. He loved camping, travel, and spending time with his family and friends more than anything else on earth. This was a very special moment that I will remember always, my only true regret… I never called him Dad. So with that, I want to say… Fred, you were a good man. You worked hard to provide for your family and raised three beautiful children. You loved your wife and family, and you showed it through your actions and not just your words. You set the standard high for being a good “father!” You also made me realize and learn a very important life lesson, to never wait that long to tell those you care about that you love them.